About how I hitched from Coachford all the way up to Galway in the northwest, with the unhappy taxi driver, silent truck driver and my Dutch host. Just a few minutes before my telephone clock would wake me up at 9 am, John McCaffrey peeked into the bedroom to say goodbye. He had to go to work (he is an engineer at Motorola in Cork), so I said goodbye too and thanked him for his invite to Coachford. After I had a shower I walked downstairs, where the kids were watching television and Martha was sitting behind her computer. The table in the dining room was made up with breakfast for me. I had cereals and some sandwiches for breakfast and Martha made a cup of coffee. The sandwiches were toasted on a very old and big stove, running on oil. The gas pits she had in the kitchen are only used as a backup, because the oil stove was much more convenient. 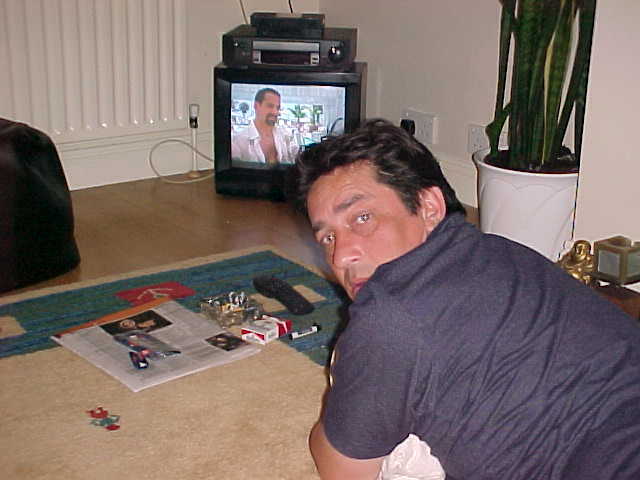 I remembered I saw the same thing at Nick Williams place in Hanbury, England. I had noticed how all the cats and kittens were sleeping against it, because it was nice and warm. The big oil tank in their back garden proved the simple use of oil. For the McCaffreys this was economical, because the stove also heated up the water in the house and that makes fewer costs in electricity and the use of gas. After breakfast Martha helped me out with a piece of carton and I made my hitching signs for my next destinations. As I had to make an over 200 kilometres distance from Coachford to the northwest of Ireland I made one say to Limerick (a city halfway) and to Galway (my destination). 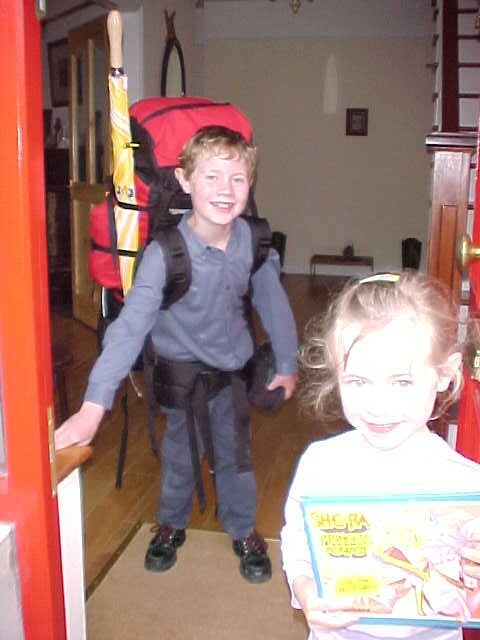 I packed my rucksack and lifted the heavy thing back downstairs. The kids were very interested in this hazardous big bag and both tried to lift it up too. Ivan also tried it using his both arms but barely fell backwards as he had lifted the back a couple of inches of the floor. As we got to the car, Ivan really wanted to wear the complete backpack. He just wanted to know how it would feel if he would travel the world in the future. With a little help he got the pack on his back and it looked very funny � such a small man with a big backpack. I just uncovered my personal caddy! Martha would bring me to the first big village up north, called Malow. Here it would be much easier to catch a ride, because in Coachford not much traffic would be driving along to the north. Along the way to Malow, Martha introduced me with the roads of the Cork County. They were pretty bad. "These must be the most terrible roads you will drive on in Ireland," she said. On poles next to the roads I saw election campaign signs saying Bad Roads No Vote. Making Corks roads better is just inevitable. The weather was cloudy and it was raining very lightly. I like that someway, because I have never hitchhiked in the rain during this complete journey. But when Martha dropped me off in Malow, along the main road heading to Limerick, the rain stopped. I thanked Martha for her generosity to let me stay for a day and waved the kids Ivan and Megan goodbye. 11 am. On the road again. I did put on a sweater under my summer jacket, it was getting a bit chilly with the wind blowing against me. With my backpack standing on the wet road I hold out my sign for Limerick and it was took only five minutes before I caught a ride. I was stunned to see a cab stop for me and when I opened the passengers door I asked him how far he was going. "And is it for free?" I asked, just to make sure. "Yes, it's already been paid for," the driver said. I stuffed in my backpack on the backseat and moved in. 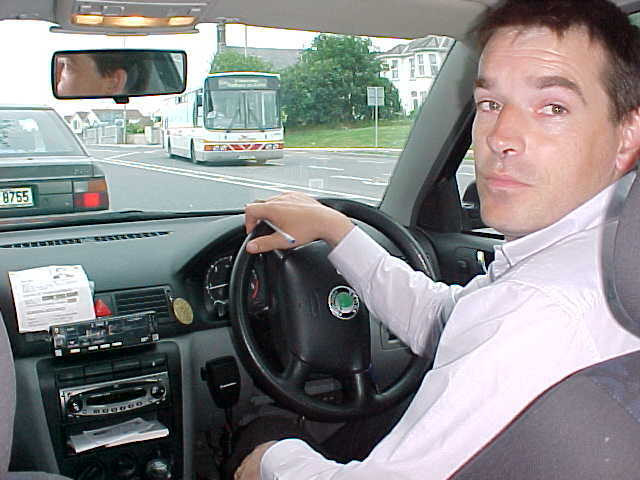 It ended up that the driver had to deliver a special type of blood to the hospital in Limerick. It was in little containers in the booth. And as he was going to Limerick anyway, he offered me the ride so I could help him stay awake. Some company is better than no company. During the 55 miles trip we talked about his job. He had been a taxi driver for six years and he started to get the feeling it was getting enough. When he heard about my hitch around the world, he was staggered. He had never heard about the no-budget part of it and asked why nobody had ever done this before. He dropped me off at a roundabout in Limerick, just after noon. The streets were dry again. 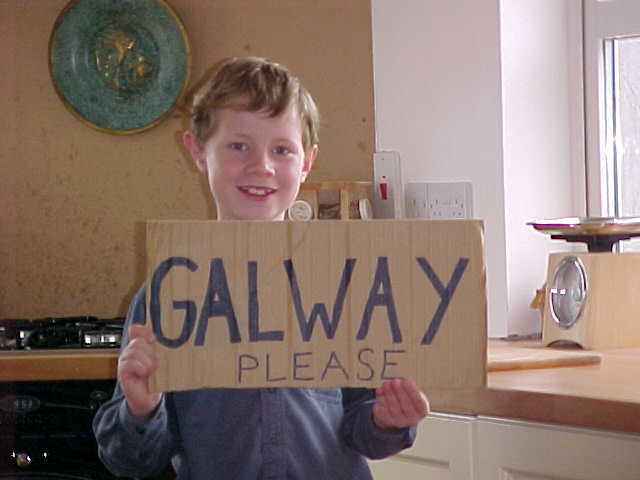 With my rucksack on my back again I walked a mile up the road where the junction to Galway was and hold out the sign. Without even looking out for cars and while I was just walking on, a car stopped just in front of me � blinking the lights. When I asked the driver if he was going towards Galway, he said: "Otherwise I would not have stopped, would I?" which sounded unsympathetic but also very reasonable. Stupid questions mean stupid answers anyway. I got in the car and he drove off. 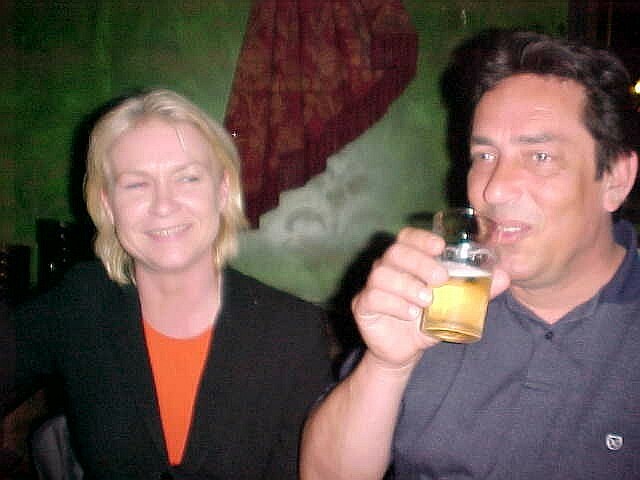 When he asked me where I was from, I told him I was from The Netherlands and I was touring through Ireland � just part of the whole truth. "Are you that guy who travels around the world for free?" he asked me. I answered him the whole truth and he started the laugh out loud. "I heard you on the Jerry Ryan Show last week! Wow!" I think I just made someone happy. "And now you are in my fecking car! Wow!" And he asked me some more questions about my journey and I told him some interesting stories. Then his mobile phone rang and when he answered the call, it sounded like he was speaking with his wife. "Hey honey, listen to this. Do you remember that guy from Let-me-stay-for-a-day who was on Jerry Ryan last week? � That website�. The dude who travels round the world? � Well, I have him right here in my car right now! �. Yes, really! �. He is going all the way to Galway today." When he ended the phone call I asked him if he was going all the way to Galway. "No, I just picked you up from the worst spot where you tried to hitch to Galway. 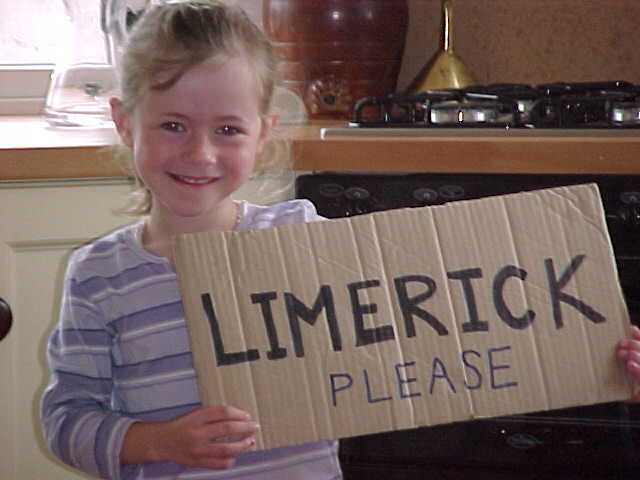 I will drop you off in the north of Limerick, where the main road to Galway goes up north. You will make a fair better chance there." That was nice of him. At another roundabout, just outside Limerick, I got out again and thanked him. On the road to Galway there was not that much traffic, so I walked a while along the road. When I passed this truck standing along the road, the driver blew his horn. He saw me walking with my Galway sign and waved to me to come to him. I opened the heavy door of the trolley and looked up to the driver. \"I just had my tea break here, but I can take you to Galway," he said. That was great and I lifted up my back into the cabin and climbed in it myself. The man just dropped off his load and was on his way home, just near Galway. He could bring me just 6 miles away from Galway, which was just perfect. As I tried to start some conversations, I noticed the man was not very talkative. So I listened with him to this radio station, where a psychiatric helps out his listener. I listened to this man who told the shrink he decided he had long enough and had a miserable life. 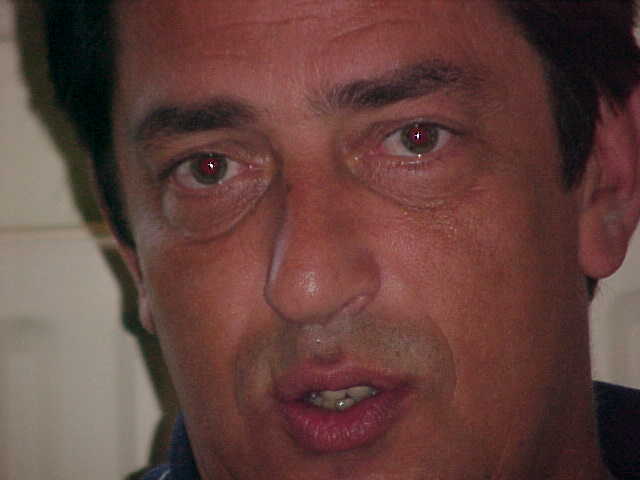 He was 44-years-old and did not feel any passion with his wife anymore and his work was boring him, but he could not do anything else. His daughter got happily married and moved to another country and he barely had any contact with him. I felt pity on this man and I become aware of the fake psychiatric who wanted to get the guy even more miserable as it was good for his radio show's ratings. A real counsellor would not do it that way, I was sure. My conclusion was that both men just had to exchange jobs, so the fake shrink finds out what labour means and so the miserable man can share his emotions with his listeners and get some real help from them. But before I found out what happened with both of them my eyes had closed. The soft vibrations in the truck, the monotonous sound of the engine and the stiff boring radio show had totally relaxed me. I shocked awake when the driver told me he was almost home. He was going to drop me off on the first following roundabout in a few minutes. "Did you sleep well?" he asked. Mmm, yes," I answered. "That sleeping while driving also happens to me quite a lot," he said. And there he scared me for a moment. "Just kidding," he said. Thank you. The silent man had humour though. When he dropped me off I only waited a minute before a van stopped for me. The young guy talked English on a level I didn't really understand, so talking did not really processes that fast. When he dropped me off in the centre of Galway, he wished me good luck on my trip, while I still was thinking about all the things he had been telling me during the short trip. I think I only understood half of it, but I just could not make his story to something complete. But hey � I had arrived in Galway! It was 4.30 pm, the sun was shining bright and I called my host for tonight to tell him I had arrived. 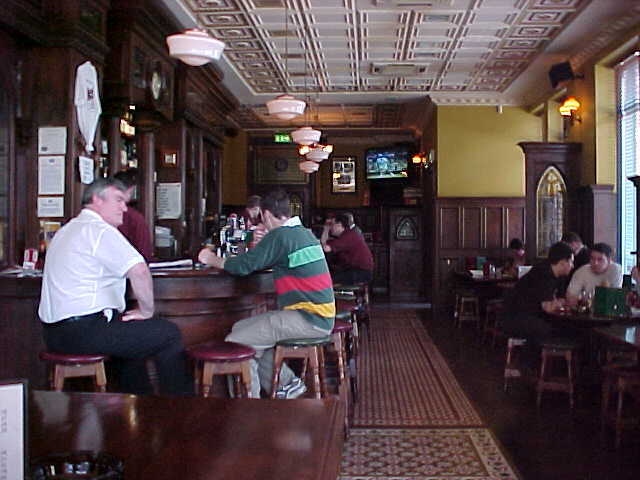 He told me to wait for him in the pub of the Garveys Hotel just at the corner of the Kennedy Park � which was just a little park on Eyres Square in Galway. As I was walking on this square I made it into the pub of the hotel, where my host arrived ten minutes later. 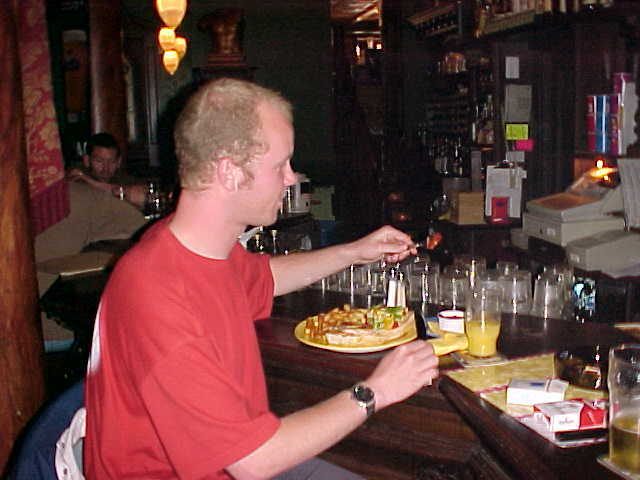 His name is Onno Vandelaak and he is a Dutch man who has been living in Galway for the last three years. When I met him we had something to drink in this pub, until he took me to a even bigger pub on the other side of the square. Here we would wait for his girlfriend Colette, who works just around the corner. It was nice to meet a Dutch guy, my first after leaving the Dutch border. Of course we spoke Dutch, something we both liked to do again. 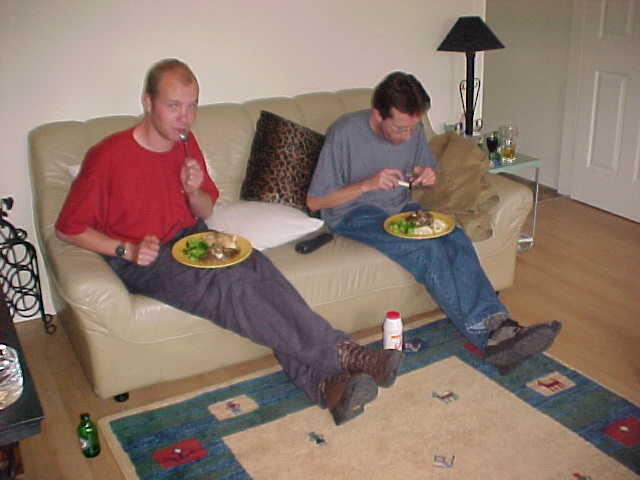 Onno lived in the Dutch city Vught when an Irish friend of him took him to Galway for a vacation. Here he fell in love with the Irish Colette and after flying back and forth from the Netherlands to Ireland he decided to stay here. He currently is freelance web designer and is the organiser of Bike The Burren, a weekly 8-days bicycle tour through The Burren, a lime-stone mountain range with long green valleys and great views � as Onno told me. When he first got in contact with The Burren, he totally fell in love with the beauty of it. He set up these tours for anybody who likes to cycle long distances, but I will tell more about that tomorrow. Onno offered me me a great tour through this area. Around 5pm I met his girlfriend Colette, coming from work. I was offered another few drinks, but I kept it down. Just simple refreshment would be good enough for know. To kill any possible hunger I might have Onno treated me a chicken sandwich. Colette said it was nice to finally meet me and she said she laughed out loud when I wrote about my eye infection, last week in Waterford. Onno drove us all to their house, just two miles from the Galway centre. Here he made a delicious shrimp salad and he let me use his computer so I could have all the time to write my June 2nd report about the visit to the Shenklin Island. As it was Independence Day in the USA, the Irish Television broadcast Primary Colours, a movie that people say is about how Bill Clinton became president, written by an insider but published anonymous. And how great! Onno is going to show me around tomorrow!